Whether you’re having pasta, pizza, or a simple roasted chicken for dinner, salad really completes the meal! 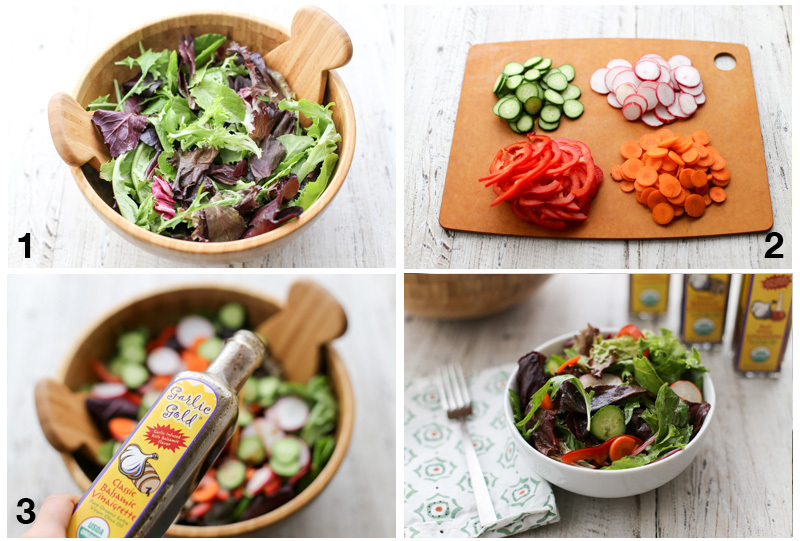 We always start off dinner with a big salad tossed with Garlic Gold® Vinaigrette. This is our simple, easy dinner salad you can make in minutes, any night of the week. 1. Rinse and dry your favorite lettuce and put it in a big salad bowl. If you’re using spring mix, spinach, or other small leaves, leave them whole. If you’re using romaine, green leaf, or another large-leafed variety, tear it into bite sized pieces. 2. Slice your favorite combination of crunchy vegetables and add them to the bowl. We like a mixture of carrots, radishes, cucumbers, and bell peppers. You can also add cherry tomatoes, green onions, mushrooms, shredded beets or cabbage . . . just pick your favorites and throw them in! 3. Toss the salad with your favorite Garlic Gold® Vinaigrette. It comes in three varieties: Meyer Lemon, Balsamic, and Red Wine Vinegar. Our vinaigrettes are more flavorful than most store-bought salad dressings, so you don’t have to use as much as other bottled varieties. A tablespoon or two per serving will make your salad pop with flavor! Sprinkle in sliced pepperoncini, red pepper flakes, or a dash of cayenne for a spicy kick. Toss cubed bread in Garlic Gold® Oil and toast it up for roasted garlic croutons. 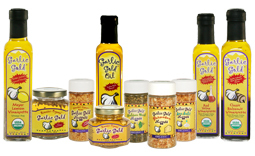 For extra crunch on top, keep a shaker of Garlic Gold® Nuggets at the table!